(New Orleans, Louisiana) – The unique 1844 proof gold Eagle, on display for three months at the Louisiana State Museum – Old U.S. Mint in New Orleans, helped attract a record of nearly 20,000 visitors during that time as part of the museum’s re-opening. The coin was displayed through the courtesy of its anonymous Florida owner with the help of Louisiana dealers Paul Hollis of Mandeville and Chuck Bloomfield of Baton Rouge who arranged for the homecoming exhibition. 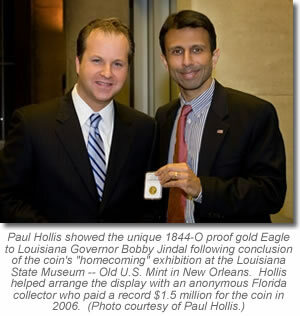 Prior to returning the one-of-a-kind coin to the collector who paid $1.5 million for it in 2006, Hollis took the gold piece to Louisiana Governor Bobby Jindal in Baton Rouge on February 17. "I wanted the Governor to have the opportunity to see such an important Louisiana treasure in person. He loved holding the 1844-O Eagle, and seemed equally thrilled to get a small handful of the 2009 Lincoln pennies," said Hollis who gave away a million Lincoln cents to the public in Louisiana in February to coincide with President Lincoln’s bicentennial birthday. "The big question from Governor Jindal was, ‘So, what’s this thing worth?’"
A total of 118,700 New Orleans Mint $10 gold pieces were made for circulation in 1844, but only one presentation proof Eagle was specially struck. It is graded NGC Proof-65 Ultra Cameo. Paul Hollis Brings $2.5 Million 1844-O Proof $10 "Home"